Mike Stelzner, as part of the opening keynote address at the Social Media Success Summit 2014 on “How To Succeed By Continuously Showing Up: Drip Feed Marketing”, used the analogy of nurturing a garden to demonstrate the important role that social media and content marketing plays in feeding your business growth. 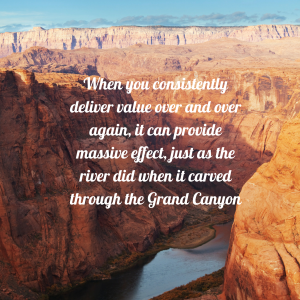 I have outlined this analogy below, incorporating my take on how I believe your business can use drip feed marketing to assist you in achieving your overall business goals. A sprinkler is neither an efficient nor effective method of watering your garden, as it uses a lot of your limited resources (namely water) and has a much wider catchment area than just the plants that you care about. Yes, a sprinkler system will reach and feed your plants, but it will also spray water over other areas of your garden, such as your weeds, the sidewalk and maybe even your house. Hitting those areas is a waste of valuable resources as it does nothing to assist you in your primary objective of watering the plants and keeping your garden looking nice. In fact, it can even do damage to your primary objective by providing fuel for your weeds. Billboard, TV, radio, and print advertising all use the sprinkler approach to marketing. As Mike describes it, a sprinkler approach to marketing is all about “sending a message to a mass audience with the hope that a tiny sub-set of that audience will resonate with the message”. Usually you will pay a premium to those people that own the audience and your distribution will be at their mercy. As a result, your message (content) will be sprayed to unintended recipients that fall outside your target market. 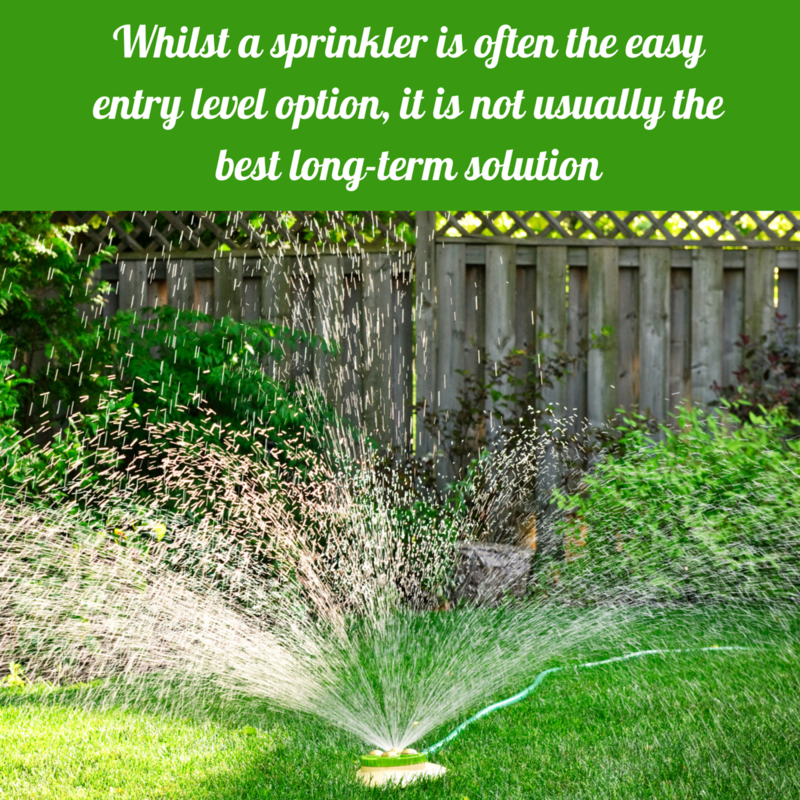 Whilst a sprinkler is often the easy default solution for people watering their garden and therefore the entry level option, it is not usually the best long-term solution. Same goes when it comes to marketing for your business. Drip feed irrigation system is the better option when it comes to nurturing a garden that turns heads (for all the right reasons). With the drip feed system you are only supplying water to the plants that actually require it. In addition to this, the irrigation system supplies directly to the roots of the plants, allowing it to achieve the maximum results with minimal output. This system is much more economical as you are not wasting water and you have the ability to send other nutrients through the irrigation system as required to maintain the health of your garden. To translate this into business, people are like seeds in a garden and you need to water your community with content, using a drip feed marketing system where possible. To achieve this, firstly you want to target those seeds that are more likely to give you the garden you desire. Then you want to nurture them so that they grow in a way that will assist you in achieving your objectives. You can achieve drip feed marketing by developing very specific relevant content that is targeted at a specific audience. Mike describes drip feed marketing as “the process of regularly delivering free content only to people who find it valuable”. As a result, “your message is strong as it is targeted to a smaller, more relevant audience”. This starts with delivering content that you know your prospects want. This will attract, feed and nurture your specific audience. The format could be written, audio or video, as per what is most appropriate for your business, as well as what you feel most comfortable delivering. If you don’t know what your audience wants – ask! Your content allows the seeds to grow. Through regularly nurturing the seeds with more valuable and relevant content, they will start to put down roots with your business (rather than your competitors), enabling you to develop a true community of people around your business. Over time, those seeds will begin to grow into plants, otherwise known as loyal supporters of your business. If you do your job well, then they start to spawn more seeds in the form of social shares and referrals. Your garden (community) will then start to grow organically and that is when your business will really start to thrive. Despite the technology driven changes to marketing distribution channels over the years, the most effective form of marketing still comes from recommendations or referrals. Rather than just the old school word-of-mouth, those referrals now also come in the form of online recommendations, star ratings, social shares and other forms of social proof. We know that people buy from those that they know, like and trusts. We can speed up this process significantly by receiving endorsements and social shares from influencers and trusted advisors as a direct result of building a community of advocates around your business. You should be aiming to get other people to recommend your business so that you can stand out enough that people remember you when they are ready to purchase. In order to achieve this on scale you need to make it as easy as possible for people to take action and share your content. You can achieve this via social plugins and by embedding one-click share options within all of the content you create. When you have lots of people social sharing your content and referring your business, you start to develop a massive loyal audience and you don’t need to be so reliant on paid external advertising sources, such as Google or Facebook Ads, for customer acquisition. This is the ideal scenario for businesses that don’t have lots of money to spend on advertising. The best type of drip feed marketing system is one where you have control over the distribution through “ownership” of the distribution channel. This could be your website, blog, email list or podcast. Each of those channels then become your hoses for distributing your content. It is important that you use social media as another one (or several other) of your hoses. However, the organic nature of social media cannot be relied upon as a drip feed marketing system. This is due to platform algorithms and various other factors that influence the distribution and reach of your content, often resulting in a large proportion of your community not receiving your content. Paid social media, such as targeted Facebook Advertising, can assist you in achieving a more reliable social media drip feed marketing system for your business. However, this can become a much more expensive option than creating your own system and should therefore only be used to supplement your own system rather than used in place of developing your own. Yes, investing in a drip feed marketing system, whether it be on a platform your own or one you share (like social media) does require more investment than a sprinkler marketing system. You have both the up front set up costs, as well as an investment of your time as you determine where you need to place your irrigation system and then lay the complex distribution mechanism to ensure that your value packed nutrients get to the places you wish to target. However, this upfront investment will pay dividends in the long run. When you provide a lot of value to people, they get enriched, come back and also refer others. 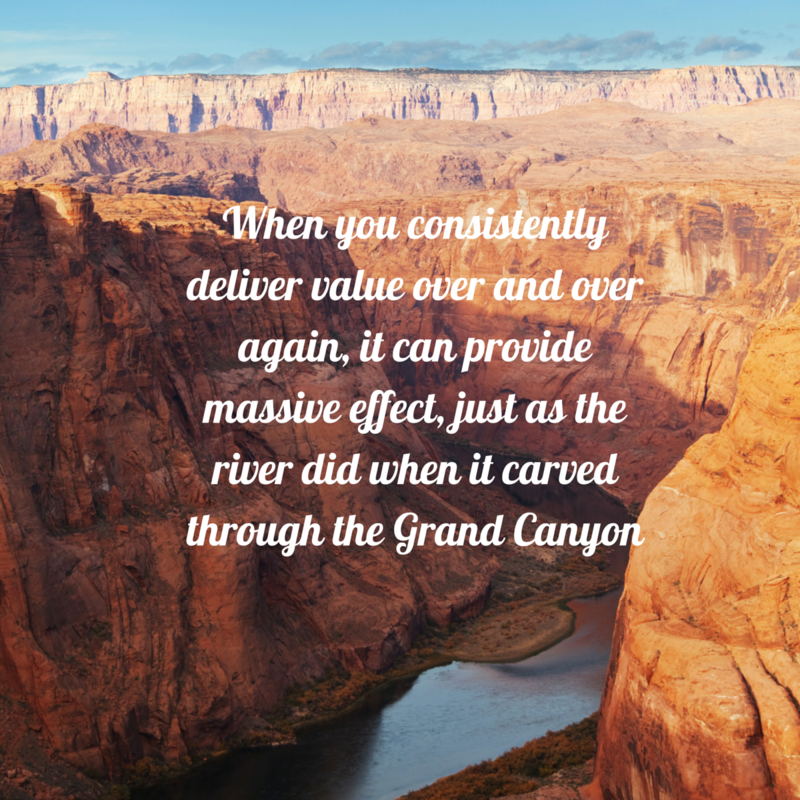 When you consistently deliver value over and over again, it can provide massive effect, just as the river did when it calved through the Grand Canyon. Have you implemented a sprinkler or a drip feed marketing system for your business?